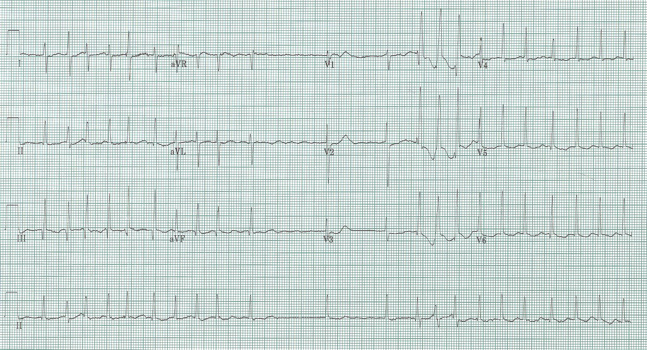 60-year-old woman with palpitations and interesting EKG. This is another example of Ashman’s phenomenon occurring during atrial fibrillation with rapid ventricular response. Ashman’s requires an irregular pattern of QRS complexes. Repolarization of any QRS complex is proportional to the previous R-R interval. Therefore when a relatively long R-R is followed by short R-R the QRS ending the short interval may find a portion of the conduction system still refractory (not yet fully repolarized). The RBBB is predictably the portion of the conducting system that is slowest to repolarize, therefore the beat following the short interval is aberrant with a RBBB morphology. If subsequent beats occur rapidly they will also find the RBBB still refractory and continue with RBBB morphology. V1 lead from this EKG show the RBBB morphology with wide QRS and tall R wave in V1. 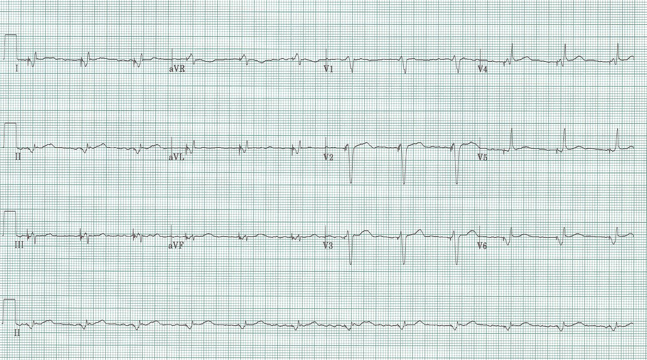 Also see “Ashman’s Phenomenon” in EKG Discussion for more examples of this common rhythm finding. 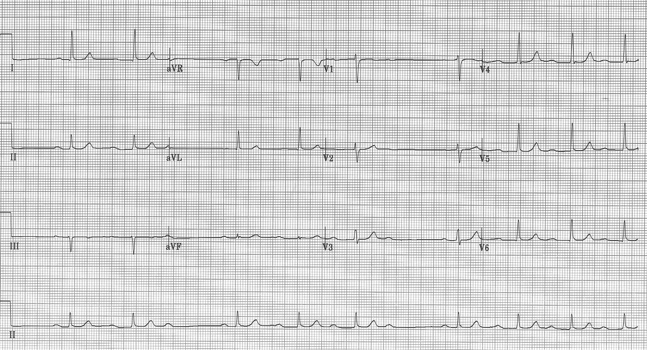 60 year old male with chest pain for 60 minutes. 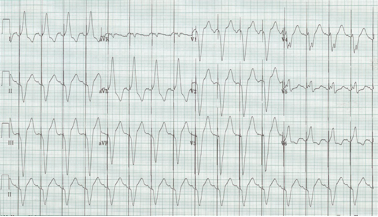 Wide-complex tachycardia in a gentleman with a cardiac history including prior MI – think no further about the etiology of this rhythm…this is V tach. What to do? 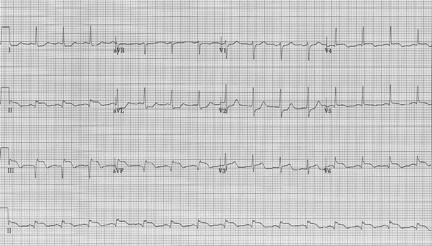 Remember ACLS protocols (and common sense) – this gentleman is having chest pain. 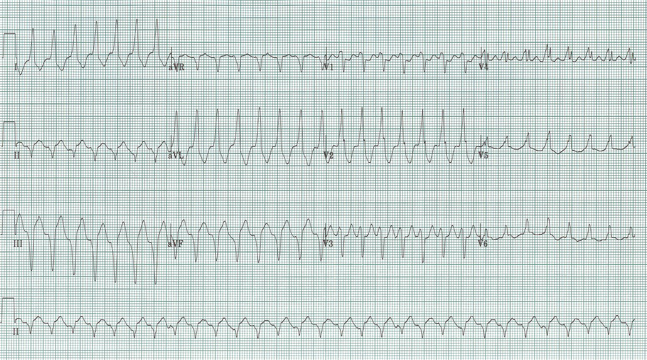 With his history, wouldn’t you like to see what is going on under all that wide-complex tachycardia? Besides, although his vital signs are currently stable, do we ever let people with active chest pain sit about with a heart rate of 180? Seriously, even though he seems very stable, this rhythm needs to be treated aggressively – electricity is the right answer. Now his acute inferior MI is easily observed, and he is quickly taken to the cath lab! What are the diagnostic criteria for this rhythm? This rhythm is 2° AV block Type I, Wenckebach. While it is easily recognizable (I hope! 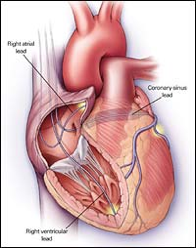 ), the actual criteria, or electrocardiographic findings, are worth reviewing. When Type I 2° AV block does not precisely follow these relationships it is typically due to underlying sinus arrhythmia, which alters the RR interval, which in turn will affect the RP and PR intervals of subsequent beats. Because of the periodic pauses, the rhythm shows “group beating,” a finding that frequently leads to consideration of the diagnosis of Wenckebach phenomenon. Does this ventricular paced complex look different from usual? Typical ventricular paced complexes – since the pacing lead is inserted into the right ventricle the current of depolarization proceeds from right to left ventricle effectively producing a wide QRS with LBBB morphology. Today’s EKG is 100% ventricular paced with a fairly narrow and normal appearing QRS complex. 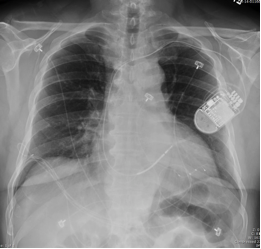 This patient has a biventricular pacemaker with one lead in the RV (also his ICD lead), and a second wire into the coronary sinus (thinner lead extending further to the left heart wall). This pacer produces simultaneous biventricular activation and is often used now in patients with significant heart failure.